Paul and Christina go on a night out and Paul gets drunk. On getting home, he kisses Caroline, thinking she's Christina. Christina isn't happy at what's happened and seems a bit overly-upset. Caroline insists that she didn't want to kiss Paul and was trying to fend him out. Paul says he was just being affectionate so Caroline tells him that neither of them want it from him. The twins stomp off to bed. Beverly is still steamed up about Jim going to Cairns to look for her. 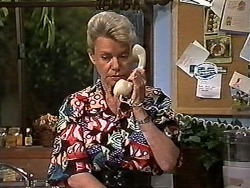 Helen suggests she rings Jim to tell him where she is. Beverly refuses, saying everyone should stay out of her business. Harold is putting the rubbish in the bin. Kerry is appalled to see how much stuff they're throwing away, says most of it can be recycled. She steals the bin and takes it off home to sort out! Paul is nursing a serious hangover. Caroline gets up and still isn't too chuffed with him. She tells him off for being "friendly" and Paul apologises, saying he was very drunk. Caroline thinks he should cut down his drinking - he's been on the grog a lot lately. Paul agrees and says he won't make any more passes - at either of the twins. Christina comes down and is obviously still upset about last night. She isn't as forgiving as Caroline and points out that Paul thought he was kissing her, not Caroline. He admits to behaving like a creep and she reluctantly agrees to forgive him. 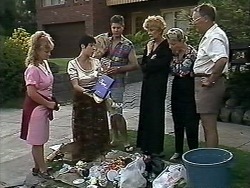 Kerry is sorting out Harold's rubbish on the front lawn. Madge and Harold bicker about the contents of the rubbish bin, which has yielded several secrets, such as a broken dinner plate(!) Kerry points out that nearly all the contents of their bin could be recycled - if they all lobbied the council they might be allowed to join the council's recycling scheme. Helen and Beverly are having a cup of tea in silence. The phone rings and Beverly rather childishly refuses to answer it. 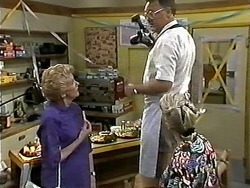 Helen answers it and it's Jim - he's beside himself about Beverly. Helen explains that Beverly is home and suggests he comes home straight away. But there's a cyclone hitting Cairns at the moment, so he's stuck there for a while. Beverly laughs and says it's poetic justice. Helen tells her off. Paul is still nursing his hangover. Caroline points out that Christina takes things very seriously - what happened wasn't a joke to her. Paul asks her to drop it, and he'll grovel to Christina later. Kerry is running up a dress for Sky on the machine. She apologises for being a bit pushy with the rubbish, but Madge says it's OK - she's decided Kerry is right and she's been to buy some recycling bins! Kerry tells Madge that Sky has been a bit grisly today, she thinks she might be sickening for something. Madge is enjoying having some freetime, she thinks she might pop down to the Waterhole to see Gloria. It's clear that Madge is missing a structure to her day though. Ewan has popped round to see how Beverly's conference went. He senses that all is not well with her. 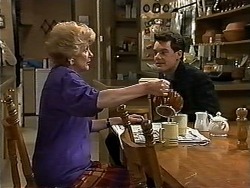 Madge answers the door to Paul - he's come to see if she wants her job back at the Waterhole. Madge quietly chuffed and Paul agrees to pay her the same as he pays Gloria. Madge says that given her experience she wants a bit more. Paul rolls his eyes and agrees to negotiate. He also has to admit that the customers prefer a woman - or in fact, they specifically want Madge back! Ewan and Beverly are looking through some conference papers, but Beverly is distracted. She finally admits that she's having a few problems with Jim - he's flown to Cairns thinking she and Ewan were having an affair! Suddenly they start laughing at the ridiculousness of the situation. Joe is amazed to hear that Lochy didn't want to eat her icecream! Kerry says that both Sky and Lochy are feeling unwell. Harold is taking some photos of his speciality dishes to advertise in his window - like the cafes in London do. Madge tells Harold that she's agreed to go back to the Waterhole - she's just not cut out for a life of leisure. Paul comes in and sits down with Christina. He wants to apologises again, but Christina says he already has. Paul tells her that he really likes her and doesn't want their friendship to suffer because he got drunk and behaved stupidly. He was down about Gail and the new guy in her life, and she helped him to cheer him out. Then he got gratitude mixed up with something else. It wouldn't have happened if he had been his normal self and it won't happen again. CHRISTINA: I just want to know one thing. Did you really think Caroline was me? PAUL: I'll answer that if you tell me one thing: What if it had been you? CHRISTINA:(running away) I really do have to get back to work. Bye.